773. THE general duties of the adjutant-general and of the assistant adjutant-generals have been laid down under the head of army organization. The adjutant-generals of the several States are required to make annual returns of the strength and condition of the militia, the state of the arms, etc., applicable to military purposes, to the governor or commander-in-chief of the State, and to forward a consolidated return of the militia, arms, etc., to the President of the United States through the adjutant-general of the United States army, agreeable to a form furnished by him. Assistant adjutant-generals, in addition to the duties already specified in general terms, attend to the formation of their divisions or brigades, publish all orders received at division or brigade headquarters; issue all orders proceeding from the general commanding the division or brigade; preserve the records of the division or brigade; inspect and form division or brigade guards; prepare and keep the necessary rosters of the officers of the division or brigade; and regulate all details for duty depending upon the rosters. 660 MANUAL FOR VOLUNTEERS AND MILITIA . quarters. The assistant adjutant-general of the division prepares, in like manner, a consolidated morning report of the division, to be transmitted to the adjutant-general of the army corps, or army of which the division forms a part. 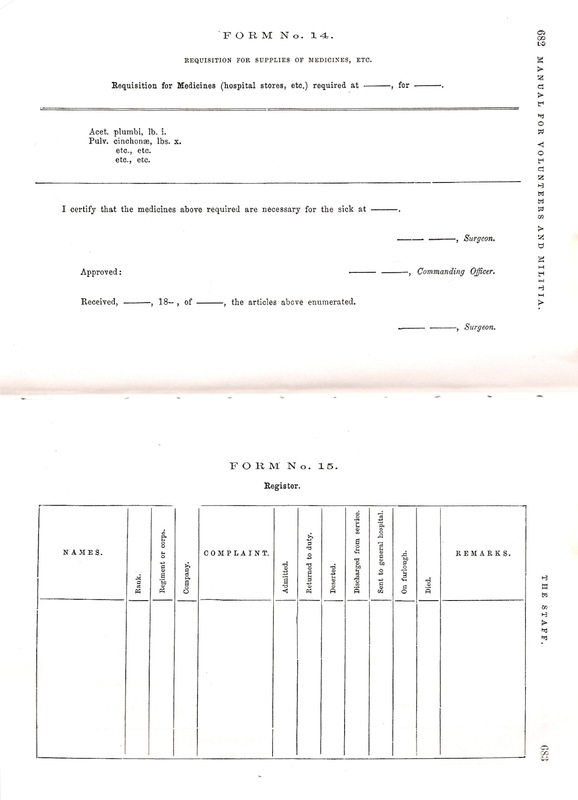 (See Form No.4). Thus the commanding-general is from day to day kept advised as to the exact strength and condition of his command. The assistant adjutant-general of a detached brigade, division, or army in the field, has to prepare a monthly return of the command, to be signed by himself and his commanding general, to be forwarded to the adjutant-general at general head-quarters. 775. 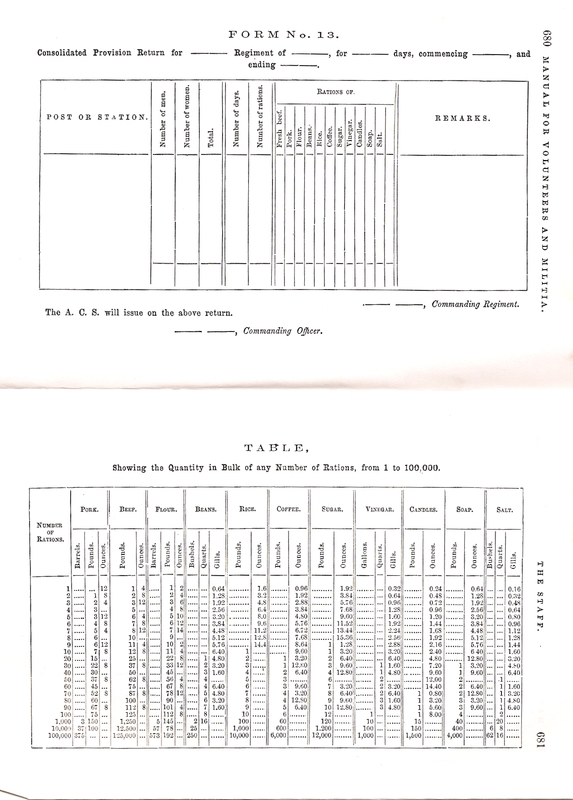 When orders are received at, or emanated from the headquarters of an army or army corps, the adjutant-general, or assistant adjutant-general, as the case may be, transmits copies to each of the assistant adjutant-generals at division head-quarters; the assistant adjutant-generals at division head-quarters in turn transmit copies to the assistant at each of the brigade head-quarters, and from brigade head-quarters they go to the adjutants of regiments, by whom they are read to the troops on parade. When troops are on a campaign, the orders are given to officers of the staff, who report for them daily at the different head-quarters. See article "Orders." 776. The parole and countersign emanate daily from head-quarters, in the form of "special orders;" copies of both under seal are transmitted to division head-quarters; from them to brigade headquarters, and from brigade head-quarters to regimental head-quarters, provided there is any officer of the regiment who is entitled to the parole; if not, the countersign only is sent. Copies of one or both are sent to such persons of the division, brigade, or regiment, as may be entitled to them. The parole is only sent to the field and regimental officers of the day, officers of guards, and to such other officers as may be entitled to visit and inspect guards. the point d is then folded over upon e, making the fold along the line fg; the projecting edge abfe is then folded over, sealed near both ends, and the "countersign" is directed on the opposite side. 779. By the militia laws of Virginia, and most of the other States, the division and brigade inspectors are the chiefs of staff of their respective divisions and brigades, and they discharge the duties of assistant adjutant-generals in the divisions and brigades with which they serve. 662 MANUAL FOR VOLUNTEERS AND MILITIA . tions, manoeuvres, formation of guards, etc. 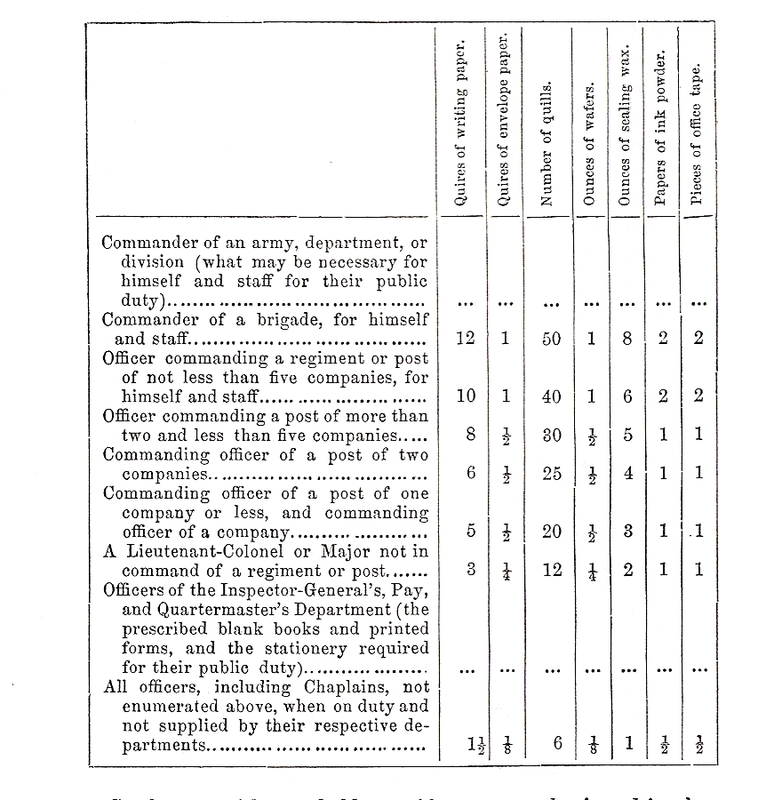 The adjutant publishes all orders received at regimental head-quarters, and issues all orders emanating from the head-quarters of the regiment; keeps a roster of the officers of the regiment, and makes all details for duty from the roster; has charge of the field-music, band, and pioneers; and discharges such other duty as his colonel may require. At the first sergeant's call, the orderly sergeants of companies present the morning reports of their companies, made off in conformity with the requirements of Form No.1, and signed by their captains. The adjutant then proceeds to make off the morning report of the regiment, as required inForm No.2, which is signed by himself and the colonel, and transmitted to brigade head-quarters. On receiving the parole and countersign from brigade head-quarters, he sends a copy of both to the colonel and to the regimental officer of the day, and copies of the countersign to the surgeon, and such other of the staff officers of the regiment as, from the nature of their duties, may require it. 779. This department has to provide quarters and transportation for the troops; storage and transportation for all supplies; clothing; camp and garrison equipage; cavalry and artillery horses; fuel; forage; straw, and stationery. Its duties, when troops are in actual service, are very important, and embrace such a wide range of subjects, that a large number of agents, and thorough organization, are indispensable. 780. Under the head of quarters are included all buildings for the use of an army; as quarters for men and officers, hospitals, store-houses, offices, and stables. When quarters are to be occupied, they are allotted by the quarter-master at the station, under the control of the commanding officer. No officer shall occupy more than his proper quarters, except by order of the commanding officer when there is an excess of quarters at the station. But the amount of quarters shall be reduced pro rata by the commanding officer when the number of officers and troops make it necessary. 664 MANUAL FOR VOLUNTEERS AND MILITIA . mess room should not be used elsewhere, or for any other purpose. Fuel issued to officers or troops is public property for their use, and what is not actually consumed should be returned to the quartermaster's department. Fuel is issued only in the month when due. 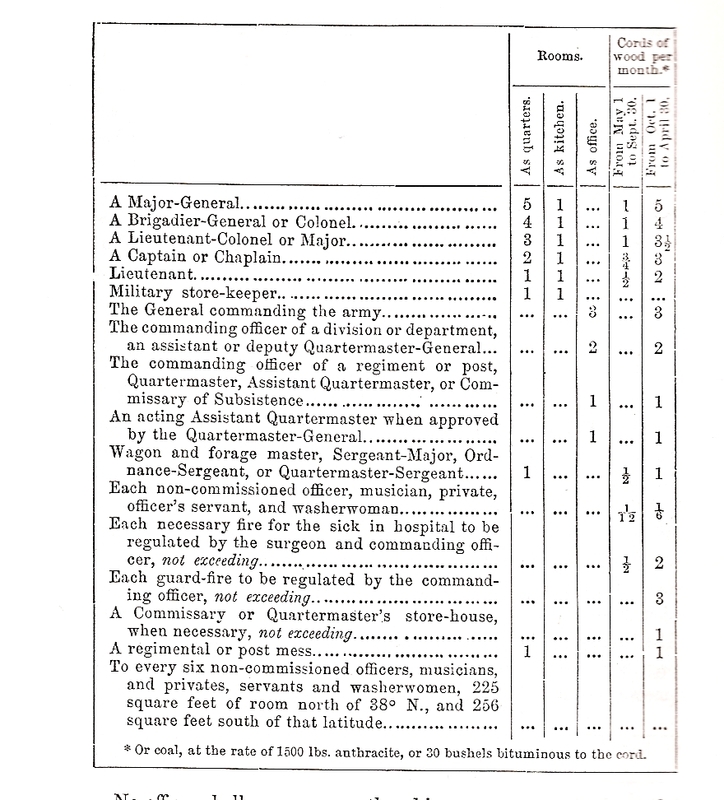 In allotting quarters, officers have choice according to rank; but the commanding officer may direct the officers to be stationed convenient to their troops. An officer may select quarters occupied by a junior; but having made his choice, he must abide by it, and shall not again at the post displace a junior, unless himself displaced by a senior. 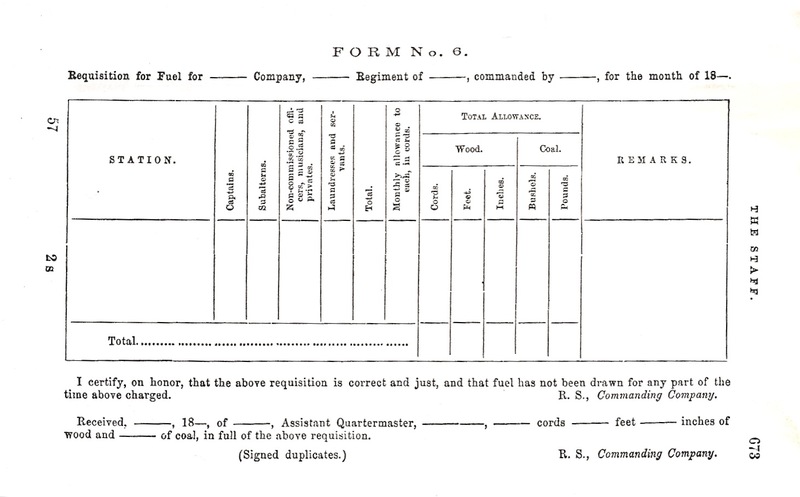 An officer arriving at a station should make requisition on the quartermaster for his quarters and fuel, accompanied by a copy of the order putting him on duty at the station. If in command of troops, his requisition should be for the whole, and designate the number of officers of each grade, of non-commissioned officers, soldiers, and servants. These amounts may be reduced pro rata by the commanding officer when necessary, and may be increased on transports by water, when proper, in special cases. All the books, papers, and instruments necessary for the duties of staff officers; also regimental and company desks, and the medicine chests of medical officers, must be transported. Estimates of the medical director, approved by the commanding officer, for the transportation of the hospital service, and the sick, will be furnished to the quartermaster. The baggage trains, ambulances for the sick and wounded, and all the means of transport, continue in charge of the proper officers of the quartermaster's department, under the control of the commanding officers. When supplies are turned over to the quartermaster for transportation, each package must be directed, and its contents marked on it. On transports, cabin passage is provided for the officers, and reasonable and proper accommodation for the troops, and, when possible, a separate apartment for the sick. 782. The forage ration is fourteen pounds of hay, and twelve pounds of oats, corn, or barley. 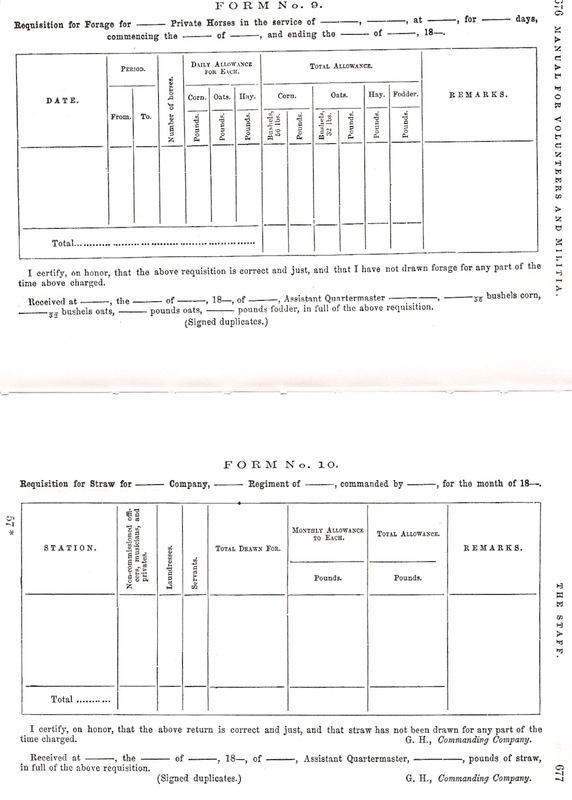 Forage is issued to officers only in the month when due, and at their proper stations, and for the horses actually kept by them in service, not exceeding in number as follows: In time of war, major-general, seven horses; brigadier-general, five; colonels who have the cavalry allowance, five; other colonels, four; lieutenant-colonels and majors who have the cavalry allowance, four; other lieutenant-colonels and majors, three; captains who have the cavalry allowance, three; all other officers entitled to forage, two: and in time of peace, general and field officers, three horses; officers below the rank of field officers in the regiments of cavalry, etc., two horses; all other officers entitled to forage, one horse. No officer is allowed to sell forage issued to him. Forage issued to public horses or cattle is public property; whatever is not consumed is accounted for. 666 MANUAL FOR VOLUNTEERS AND MILITIA . Steel pens, with one holder to 12 pens, may be issued in place of quills, and envelopes in place of envelope paper, at the rate of 100 to the quire. To each officer is allowed an inkstand, one stamp, paper-folder, sand-box, wafer-box, and as many lead pencils as may be required. Necessary stationery for military courts and boards will be furnished on the requisition of the recorder, approved by the presiding officer. officers of quartermaster and pay departments, will be procured by requisition on the quartermaster-general. Postage and dispatches by telegraph on public business, paid by an officer, will be refunded to him on his certificate to the amount, and to the necessity of the communication by telegraph. 784. Supplies of clothing aud camp and garrison equipage will be sent by the quartermaster-general to the officers of his department stationed with the troops. The contents of each package, and the sizes of the clothing in it, will be marked on it.. Bed sacks and straw are provided for troops in garrison. Requisitions will be sent to the quartermaster-general for the authorized flags, colors, standards, guidons, drums, fifes, bugles, and trumpets. Commanders of companies draw the clothing of their men, and the camp and garrison equipage for the officers and men of their company. The camp and garrison equipage of other officers ;drawn on their own receipts. When clothing is needed for issue to the men, the company commander will procure it from the quartermaster on requisition, approved by the commanding officer. 668 MANUAL FOR VOLUNTEERS AND MILITIA. by the captain in a company book, the account setting forth the money value of the clothing received and receipted for. 785. Every separate command should have its quartermaster; if it is a regiment, or less, one of the subalterns may discharge the duty by order of the commanding officers; if a brigade or division, an officer of the quartermaster department is assigned by the quartermaster-general. In the volunteers and militia, quartermasters are appointed by the colonels, brigadier-generals, or major-generals of regiments, brigades, or divisions; but while quartermasters so appointed must obey the directions of their commanding officers, their accountability as officers of the quartermaster's department is just the same. All requisitions for supplies, for transportation, forage, etc., are made upon the quartermaster of the command requiring them; if it is in his power to fill the requisition, he docs so; if not, he makes his requisition upon the next higher officer of the department, and so on. In order to facilitate the operations of the department, depots of supplies, in charge of depot quartermasters, are established at convenient points, and from which quartermaster's supplies are drawn upon proper requisition. 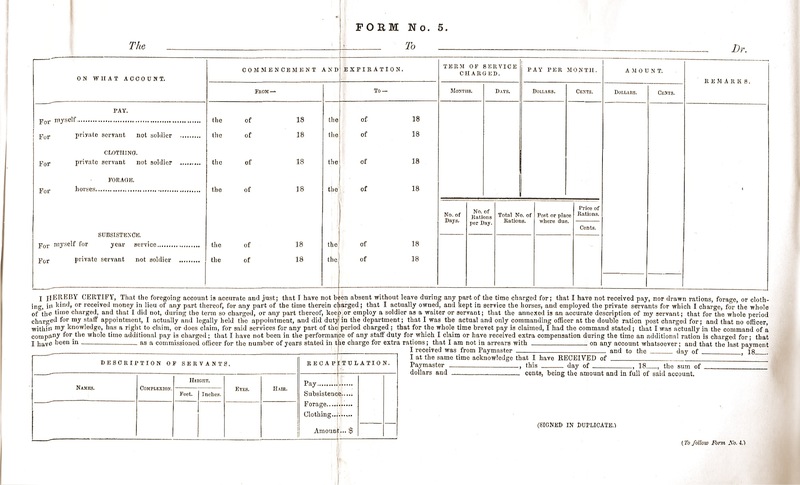 In order to secure a proper accountability on the part of the officers of the quartermaster's department, the quartermaster-general should institute a proper system of returns, accounts, etc., requiring all officers of the department to conform strictly to their requirements, and in the settlement of their accounts to present satisfactory vouchers for all money or public property expended. For the necessary forms see the general regulations of the United States army. 780. Every command should have its commissary or assistant commissary; when the command is less than a regiment, the same officer may, and usually does, discharge the duties of both commissary and quartermaster. commanding officer, in the same way that quartermaster's supplies are issued. The commissary must, however, so regulate his own requisitions upon purchasing or depot commissaries, as to keep on hand a sufficient supply to meet the wants of the troops. Good and sufficient store-room for the subsistence stores will be procured by the commissary from the quartermaster. 787. The ration is three-fourths of a pound of pork or bacon, or one and a fourth pounds of fresh or salt beef; eighteen ounces of bread or flour, or twelve ounces of hard bread, or one and a fourth pounds of corn meal, and at the rate, to one hundred rations, of eight quarts of peas or beans, or, in lieu thereof, ten pounds of rice; six pounds of coffee; twelve pounds of sugar; four quarts of vinegar, one and a half pounds of tallow, or one and a fourth pounds of adamantine, or one pound sperm candles; four pounds of soap, and two quarts of salt. On a campaign, or on marches, or on board transports, the ration of hard bread is one pound. 788. Company provision returns are usually made every week or ten days, in accordance with Form No. 12; the return must be signed by the commanding officer of the regiment, or post, when the command is less than a regiment. When it is practicable, a consolidated return for the regiment or post is made and signed by the commanding officer (see form 13) ; but the return must state the allowance for each company, in order to prevent any confusion in the issues. Issues to the hospital are made on returns by the medical officer, for such provisions only as are actually required for the sick and the attendants. 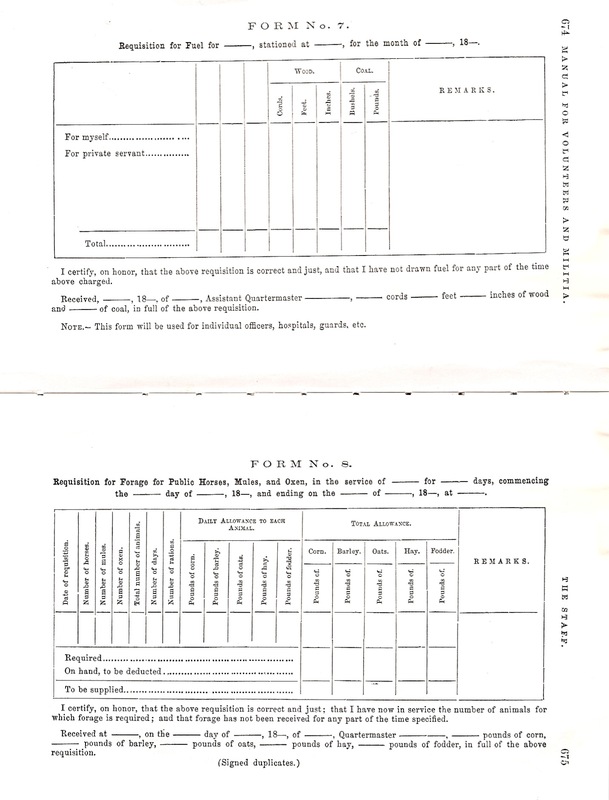 The cost of such parts of the ration as are issued is charged to the hospital at contract or cost prices, and the hospital is credited by the whole number of complete rations due through the month at contract or cost prices; the balance, constituting the hospital fund, or any portion of it, may be expended by the commissary, on the requisition of the medical officer, in the purchase of any article for the subsistence or comfort of the sick. 670 MANUAL FOR VOLUNTEERS AND MILITIA. An extra issue of fifteen pounds of candles per month may be made to the principal guard of each camp or garrison, on the order of the commanding officer. Extra issues of soap, candles, and vinegar, are permitted to the hospital when the surgeon does not avail himself of the commutation of the hospital ration, or when there is no hospital fund; salt in small quantities is issued .for public horses and cattle. When the officers of the medical department find antiscorbutics necessary for the health of the troops, the commanding officer may order issues of fresh vegetables, pickled onions, saur kraut, or molasses, with an extra quantity of rice and vinegar. Potatoes are usually issued at the rate of one pound per ration, and onions at the rate of three bushels in lieu of one of beans. Troops at sea are recommended to draw rice and an extra issue of molasses in lieu of beans. When a soldier is detached on duty, and it is impracticable to carry his subsistence with him, it will be commuted at seventy-five cents a day, to be paid by the commissary, when due, or in advance, on the order of the commanding officer. The ration of a .soldier stationed where he has no opportunity of messing, is commuted at forty cents. 789. As in the case of the quartermaster's department, the commissary-general should organize such a system of returns, accounts, etc., on the part of the officers of the department, as to ensure a proper accountability on their part. See the army regulations for the necessary forms. 790. The senior medical officer, on duty with any body of troops in the field, will, unless otherwise specially ordered, be ex officio the medical director; and will have the general control of the medical officers, and the supervision of the hospitals under their charge. The senior medical officers of a hospital distribute the patients, according to convenience and the nature of their complaints, into wards or divisions, under the particular charge of the several assistant surgeons, and should visit them himself each day, as frequently as the state of the sick may require. His prescriptions of medicine and diet are written down at once in the proper register, with the name of the patient and the number of his bed; the assistants fill up the diet table for the day, and direct the administration of the prescribed medicine. He should enforce the proper hospital regulations to promote health and prevent contagion, by ventilated and not crowded rooms, scrupulous cleanliness, frequent changes of bedding, linen, etc. 791. At surgeon's call, the sick then in the companies will be conducted to the hospital by the first sergeants, who will each hand to the surgeon, in his company book, a list of all the sick of the company, on which the surgeon shall state who are to remain or go into hospital; who are to return to quarters as sick or convalescent; what duties the convalescents in quarters are capable of; what cases are feigned; and any other information in regard to the sick of the company he may have to communicate to the captain. He will then make a morning report of the sick to the commanding officer (Form No. 17). 792. The troops should be paid in such manner that the arrears shall at no time exceed two months, unless the circumstances of the case render it unavoidable. The paymaster-general should take care, by timely remittances, that the paymasters have the necessary funds to pay the troops. The payments, except to officers and discharged soldiers, are made on muster and pay rolls; those of companies and detachments, are signed by the company or detachment commander; those of the hospital are signed by the surgeon; and all muster and pay rolls are signed by the mustering and inspecting officer. Copies of the necessary blank forms for muster and pay rolls may always be obtained from the office of the Adjutant-General U. S. Army, Washington. These blanks are too large to be properly represented in a work like this. 672 MANUAL FOR VOLUNTEERS AND MILITIA . are called in alphabetical order. 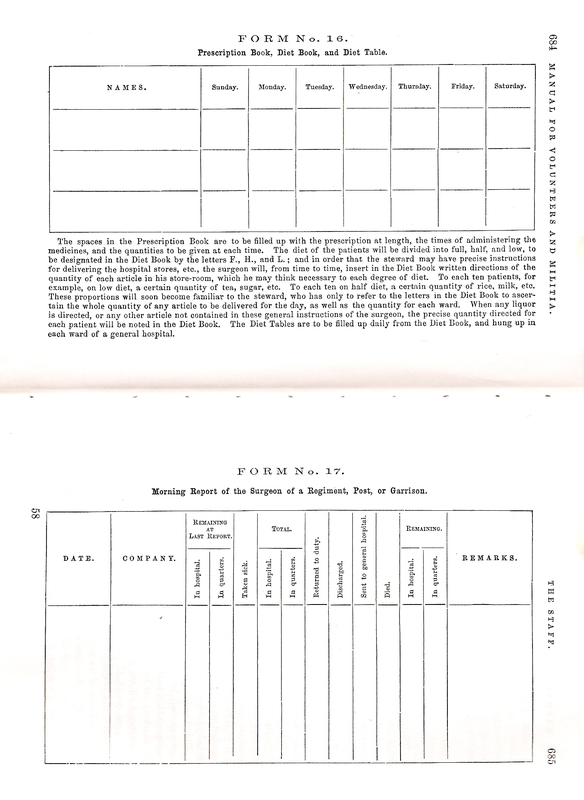 Every member of the company, or detachment, must, on receiving his pay, sign his name opposite his name the pay roll, and his signature must be witnessed by the captain, or some other officer of the company, or detachment, whose duty it is to be present when the company, or detachment, is paid. Officers are paid on certified accounts, as in Form 5.